In an unexpected twist of events, former PC leader Patrick Brown has registered to run in the race prompted by his exit. The candidates running for the Ontario Progressive Conservative leadership issued statements Friday criticizing Patrick Brown's move to join the race after he was forced to step down due to allegations of sexual misconduct. Brown registered just before the sign-up deadline at 5 p.m. on Friday, and the reaction from the other contenders was sharp and swift, with two of them saying his candidacy is an unwelcome diversion from their ultimate goal of battling Kathleen Wynne in the June 7 provincial election. Toronto lawyer and businesswoman Caroline Mulroney called Brown's move a "distraction" in a tweet Friday afternoon. The determination of who is suitable to be a candidate in this leadership race is up to LEOC. As I’ve said before, Patrick Brown made the right decision to step down. A leadership election is not the place for him to try to clear his name. Doug Ford's statement slammed the former PC leader directly saying the party is "objectively stronger without Patrick Brown." He echoed Mulroney's position, also calling Brown's move a "distraction." Former MPP Christine Elliott, who lost to Brown in the last leadership race, released a statement saying "with fewer than 100 days, now is a time for unity. I am the leader that can unite the party and beat Kathleen Wynne." Elliott made an appearance on CBC's Power and Politics Friday, saying she believes voters will look past the apparent disarray in the party. Meantime, Tanya Granic Allen hasn't commented herself but her conservative activist organization Parents As First Educators released a statement to its members. "Tanya believes Patrick shouldn't be allowed as a candidate for MPP. But for leader? She welcomes him, because finally, he will be held to account for his political crimes. And she is the only one in the leadership race who is holding him to account," the letter reads. Brown's bombshell came just hours after the party's interim leader Vic Fedeli announced that the former leader had been kicked out of the PC caucus, raising questions about whether he can run for the leadership. Party president Jag Badwal released a statement saying only, "Mr. Brown's application will follow the same due process in the same manner as the other four declared candidates." 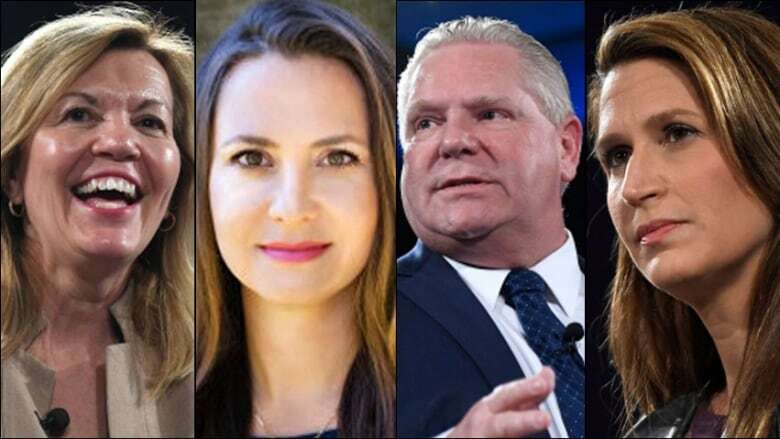 Elections Ontario has listed Brown as one of five candidates vying for the party's top post just a few months ahead of the provincial election. In the first leadership debate, held Thursday night, the four other candidates were asked if they would allow Brown to run for their party in wake of the allegations against him by two women — accusations he has strenuously denied. Both Elliott and Mulroney said they would allow it if the allegations are proven false. "If he can clear his name, then he can run," Mulroney said. Ford said he wants to get the facts and sit down with Brown before making a decision. "I'm not going to litigate this in front of the media," he said. But political newcomer Tanya Granic Allen came down hard on Brown. She says he shouldn't be allowed to run, not because of his alleged misconduct, but due to what she called the corrupt way he handled the party. PC members will cast their vote for their next leader electronically between March 2 and March 8, and the results will be announced March 10.